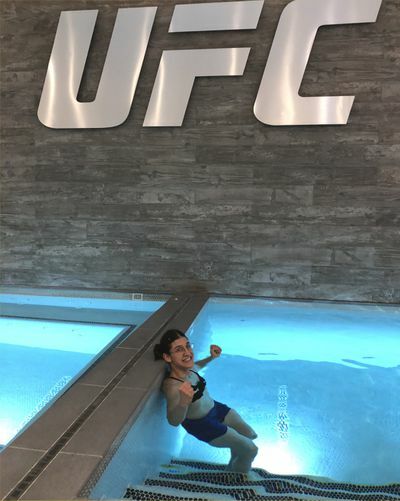 Top ranked UFC flyweight and TUF 26 finalist Roxanne Modafferi gives fans an inside look at her day-to-day training routine. The life of a professional fighter is all about consistency and discipline. I wanted to give fans a glimpse into that world, by detailing my favorite day of the week—Monday. If I’m lucky, I’ll wake up at 4:30 AM or later. Lately it’s been around 4 or 3:30 and I don’t know why. My body just wakes up! I eat a four-course breakfast: yogurt with cereal, toast with peanut butter, a two-egg cheese omelet with vegetables, and salad with spinach, lettuce, steamed broccoli, carrots and other veggies. It takes me about an hour and a half to cook and eat everything, but my breakfast has to hold me until 1 PM—which is when MMA practice ends. I post on social media and read emails for a bit before laying back down for a post-breakfast nap from 6 to 7 AM. I often have interesting dreams during that time, usually reflecting my real life. Once, in the real world, my dad was encouraging me to buy a new car. (I don’t want a new car. I love my 2008 Toyota Corolla.) That morning I dreamed that my mom pushed my car into an icy river, and I was so distraught that I jumped into the river and tried to pull it out. Another morning, I dreamed I was late to practice because I couldn’t find any of my clothes and gear, and kept running through the gym in a panic while everybody else was training. After I wake up from my prosaic nap-dream, I go for a jog with sprints mixed in for about twenty minutes around the block. I like listening to Metallica, Rob Zombie, and other heavy metal to hype myself up. I use this as a kind of meditation, or mental preparation, space for the day. I visualize myself fighting my opponent: successfully landing combos and techniques, as well as the fight not going my way. But, I rally and pull myself out of any slump to take the win. I want to always think positively about the outcome, but not so much that I end up feeling surprised and frustrated in the fight if my opponent has success. 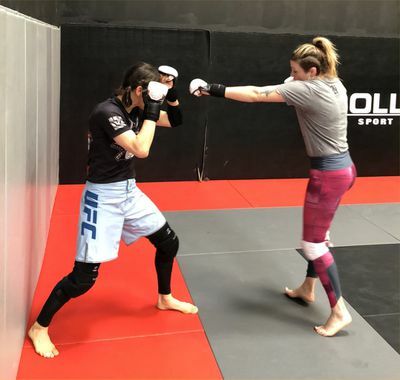 Roxy training with Joanne Calderwood. Back at my apartment I do yoga for about 30 minutes, stretching out thoroughly with the poses I learned at my favorite yoga studio, Vegas Hot!Yoga and Pilates. I cannot start my day unless I do these stretches, or I will break. I also take this time to bang out fifty push-ups. Then I cook lunch, pack my clothes, take a caffeine pill, and I leave my apartment with my apartment-mate/teammate Serena DeJesus. Serena and I arrive at Syndicate MMA at around 9:30 AM to get ready for my mitt session with head coach John Wood. I have to wrap my hands, tape my various body parts (toes, bum joints, fingers, whatever) put all my knee pads and elbow pads on, etc, and warm up a second time. In my upcoming fight on April 20th, in Russia, I’m fighting southpaw Antonina Shevchenko. So, Coach John has been switching stances and holding mitts backwards (so to speak), in preparation. He’s such a talented mitt holder and I’m so fortunate to be his student at Syndicate. 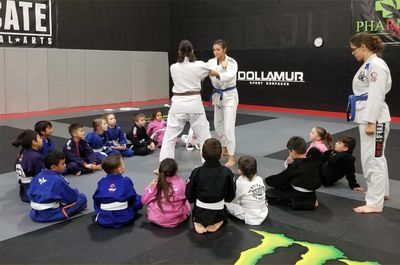 He teaches not only punch-kick combinations, but cage control, range, how to close the distance to enter in for a take-down, and how to chain wrestle someone to the ground if they try and defend the initial take-down attempt. Considering my background and my past victories, if I get her to the ground, a win seems very likely. But, it would be pretty cool to knock her out, too (I just want one KO on my record). She’s a skilled fighter, though, so I doubt she’ll be easy to take down or knock out. What will my game plan be? Wait and see. From about 10:00-10:45 I have my private session. 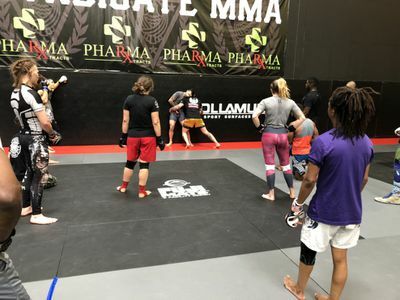 Lately I’ve been jumping into Mike Pyle’s no-gi grappling class, which is running at the same time, to get some great drilling and a few rolls in. Mike is such a master at grappling for MMA. I often schedule private jiu-jitsu lessons with him as well. MMA class runs from 11:30-1:00 PM, but we usually run overtime. Mondays are my favorites because the theme is grappling for MMA. Coach John teaches strikes to take-downs as well as wall wrestling, which are my strong points. Fellow UFC flyweight JoJo Calderwood is one of my best training partners. We really challenge each other and push each other to become better fighters. She has gotten good at switching stances to southpaw, which helps me a lot. 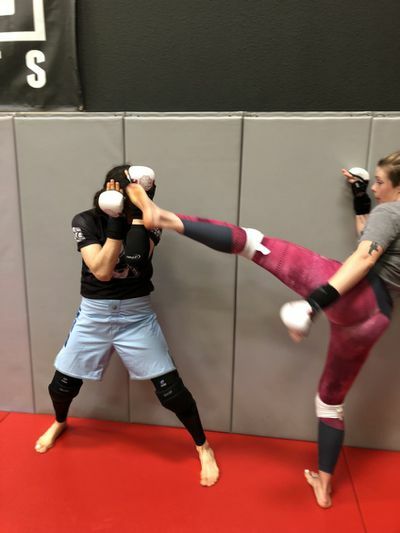 Also, I’ve been asking her to try and clinch or kick me in the head a lot, since Antonina is a Muay Thai artist and that’s also JoJo’s strong suit. It’s been fortunate that my bestie Serena is a southpaw, too, and bigger and physically stronger than me. Serena and I have been training together for at least three or four years. I feel well prepared for my opponent. I have lots of other amazing training partners at Syndicate, both male and female. After practice, I’m at energy level zero. I give everything to my training session. I want to leave the mat with nothing left. After I drag myself to the locker room, I guzzle down my Muscle Pharm recovery drink “RECON” with protein powder, and scarf down my lunch. It’s always the same—a granola bar, followed by boiled or grilled chicken, steamed vegetables, and some variety of sauce and seasoning to make it interesting. It’s usually 1:45 by the time I finish eating and showering. From there, I drag Serena to the UFC Performance Institute (UFC PI), which is luckily located right smack dab between Syndicate and my apartment! I freeze my keister off in the ice bath for five minutes, then sit in the heavenly hot tub for recovery. Forcing myself out of the coziness is almost as sad as the cold plunge. This process helps with muscle soreness, though. I feel like a car wreck the next day if I don’t torture myself with an ice bath, so it’s worth it. After I change my clothes, I walk over to the PI cafeteria to pick up the meal I requested ahead of time that’s left out for me. One of the perks we get is that fighters on the UFC roster are entitled to free meals. We get home around 2:30 PM. I throw my dirty clothes in the hamper, and shove my food in the fridge for tomorrow’s lunch. If I’m lucky, I can lay down for about twenty minutes before I have to start getting ready for my kids class. However, I usually have to clean or tidy up something, or prepare my dinner (fish and veggies). Portable tuna packs from the grocery store are a genius invention, especially the flavored ones! 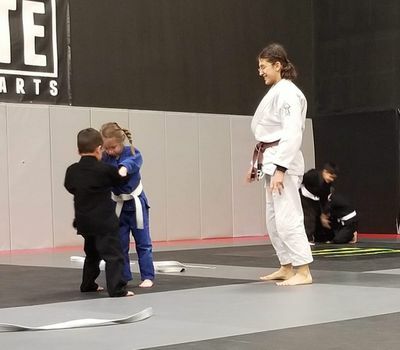 I throw new training clothes and a gi in my bag, pack food, summon Serena from where she collapsed in her room, and we head back to Syndicate in time for my 4:00 PM jiu-jitsu class. I usually have a little bit of energy back, but I absorb the kids’ happy energy, as well. I’m in charge of the kids age group five-to-seven-years-old. I’m fortunate to have Serena and my other teammate, Jeslen Michelle, assisting. At five o’clock my class ends, and I switch roles and become the helper for Rick “The Flying Squirrel” Davis, a retired UFC fighter and BJJ black belt. He’s currently a fifth grade teacher. After school, he rushes to Syndicate to teach the teenage class. I help coach and sometimes roll with the teenagers. After class ends at 6 PM, I eat my fish and veggies... or if I’m not on a diet, I go with Serena and chow down without abandon on Mexican food, sushi, or poke bowl. But it’s usually just fish and veggies. I’m so exhausted. I have to eat in the locker room or out at a restaurant, because I have a hard time stopping eating once I start. I think it’s the shadow of an eating disorder I developed from dieting and cutting weight over the years. If I’m home, I’ll just eat and eat and eat. I can’t keep open bags of snacks in the house. I can’t have a big pie sitting around. I only buy mini servings of ice cream. I have to portion my meals into Tupperware, eat them out, brush my teeth, and THEN I can go home and not crave anything. That’s how I manage. Once we get home around 6:30, I do laundry and check social media. By 8:00 PM, I have exactly one hour of free time to watch TV before I pass out around 9:00 with Roxalepsy. Even if I wanted to stay up later, I have to go to sleep that early, because my body will wake me up at 3:30 or 4 AM no matter what! I marathon all my training in the morning, and then recover in the evening. I always watch Japanese anime, a movie, or comic book hero TV series like the Flash or Arrow. Over my career, I’ve realized that I function very well if I stick to habits and routine. It takes away the element of choice that would allow me to slack off if I don’t “feel like” doing something unpleasant. I never feel like going to hot yoga, but I autopilot to class twice a week because my body needs it. I don’t give myself an option. I hate sprinting, but when I reach the stop sign, it’s time to sprint to the fire hydrant. I always do the same stretch routines. I always do three sets of thirty burpees every Tuesday morning before my mitt session, and on Saturday to keep my cardio up. Strength and conditioning is Wednesday and Saturday. Everything is scheduled to produce the optimum results and use of my energy. I never go out and party at night. Staying up for the main event of a UFC on TV is a challenge. Occasional tacos and nachos are my party. My fight camp life is pretty much just like my regular life, because I don’t feel satisfied with myself if I ever feel that I’m slacking off or doing less than I’m capable of. I’m always training as hard as my body will allow. This is why I’m always evolving and improving every time you see me fight. Thanks for reading about a day in the life of Roxy! 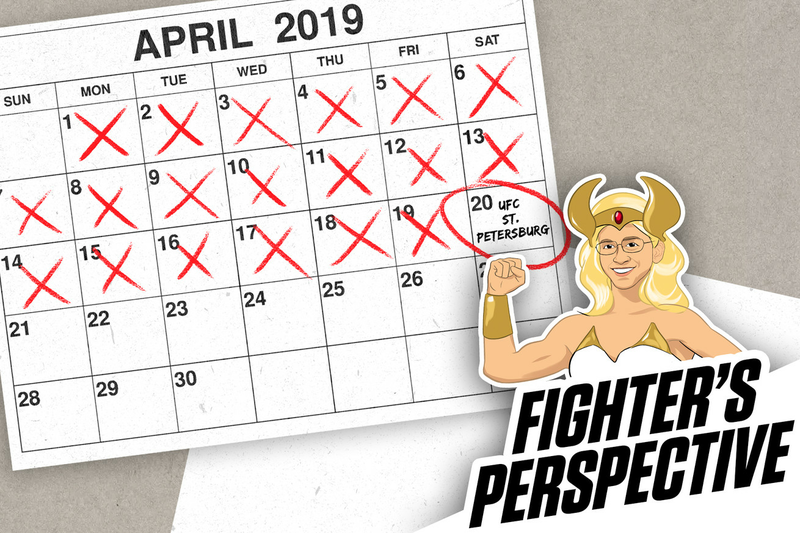 Tune in to UFC Fight Night St. Petersburg April 20th to see me face off against Muay Thai specialist Antonina Shevchenko.